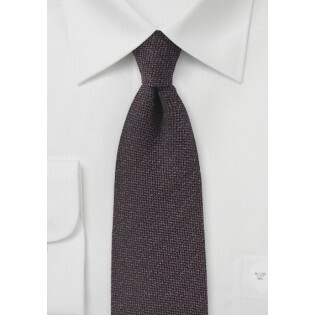 This tie may appear coffee brown to you or maroon depending on the light. But in either case, it is fully a celebration of simplicity, versatility, and Autumn! 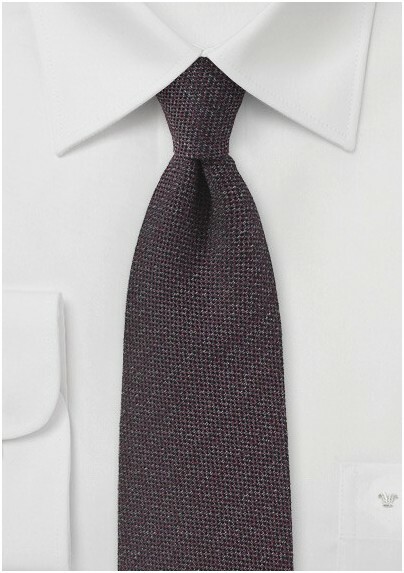 Made from a woven raw silk to create a matte texture, this tie is ideal for any event in the colder months. The gorgeous maroon-brown color gives the tie a depth and warmth that will greatly enhance any outfit, especially dark navy, olive, or drown suits. This tie belongs to the latest line by Chevalier. It features a very original raw silk weave, which creates the appearance of wool while being much softer to the touch. These ties are in a standard length of 58 inches but in a slightly slimmed down width of 3.1 inches, creating a modern appearance without being a skinny tie.